It is a very important task to provide your club with proper marketing and advertising activities. 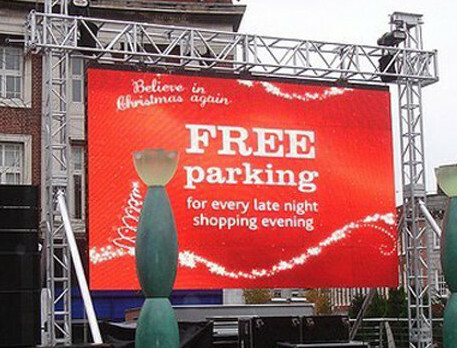 LED signs are the best possible solution for catching the eye of your potential clients, market partners and visitors. They are large, visible, and have dynamic flashing content which makes them an ideal investment in further business growth. All the entertainment displays offered by our company provide high quality visualisation of information for your customers. Our LED displays can effectively display the club's most important and newest information. For these purposes our LED displays are the best possible medium as they are capable of updating all new content within a second. Our LED screes are applicable for both indoor and outdoor purposes. The specific tasks may include, for instance, displaying the event schedules, guidance to toilets, bars, entrances, other general information, etc. You can also mount your LED screens outside in order to become more visible even in the area relatively distant to your club, restaurant, or a pub. Since our LED signs can be both small, medium, or large, you can place them in a highly populated areas such as city centres, motorways, or other areas with good points of view because LED signs are characterised by their eye-catching capabilities. Providing your club with extra outdoor advertisement signs and displays is a starting point to attract new business, marketing and customer opportunity.